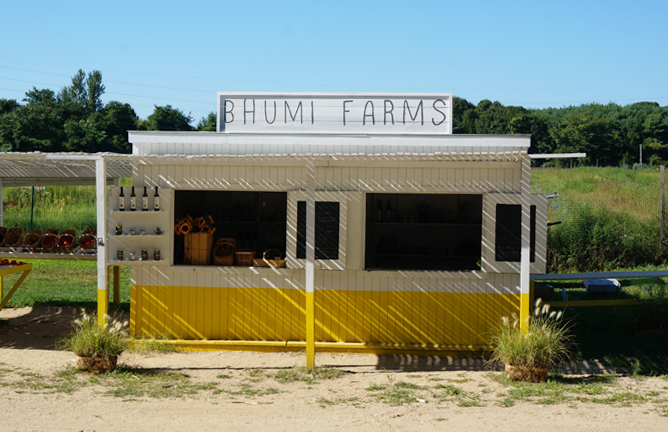 The striking yellow stand of Bhumi Farms as seen from the road. 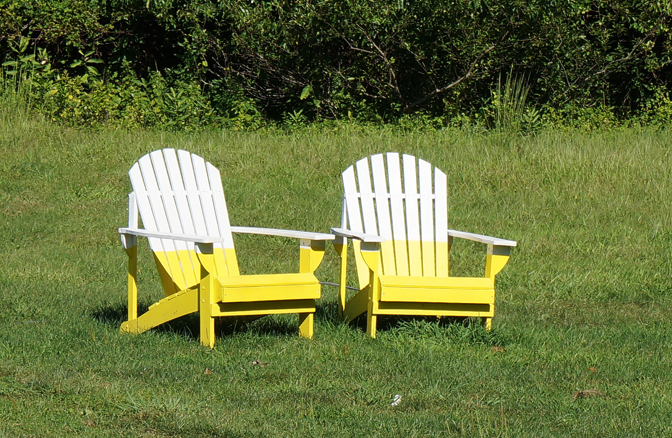 It must have been the bright yellow that first caught my attention. It’s a good yellow, isn’t it? A happy yellow. But then Bhumi Farms held my attention because there is so much more to it than just a good paint job. 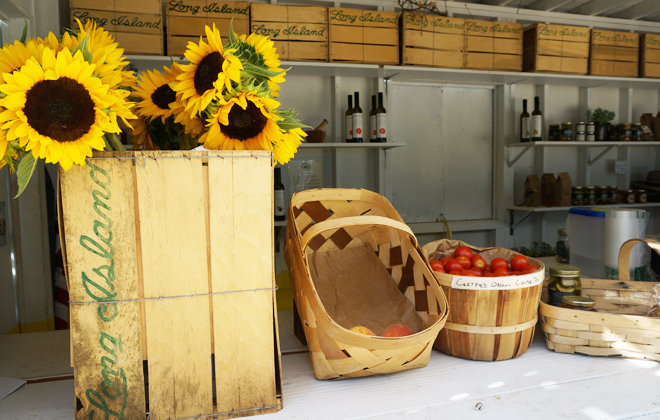 There are a hundred and one farm stands out here in the Hamptons. We are blessed with choice out here, but there are few organic farm stands out East. Surprising, but true! One thing I prefer is buying organic produce whenever I can. 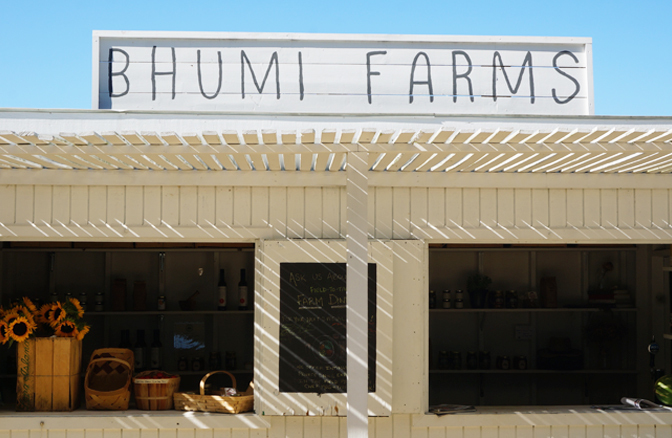 So when I learned that Bhumi Farms has much more going for it beyond the fabulous yellow paint, I was hooked. 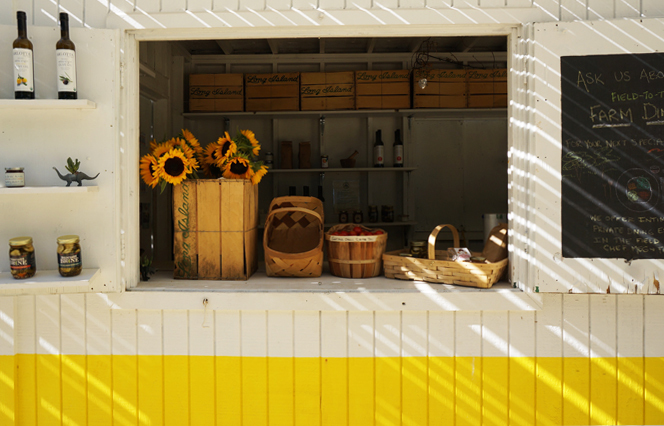 With its deeper mission of supporting local organic farmers as well as becoming certified organic themselves this past April, it is now one of my go-to farm stands, and the fact that it is designed to perfection only makes it so much more fun. The farm was started a few years ago by Frank “Farmer Frank” Trentacoste, who in his forties decided to quit his career as a financier on Wall Street to pursue an important mission: to grow food and promote healthy organic farming. You all know that we love the about-face career calling here at Interior Monologue. Meeting Frank, you can still detect a bit of the Manhattan/Wall Street “can-do” approach but also believe it isn’t possible that was ever his world. Farmer Frank seems truly in his element on the farm. When I visited, he was working in the fields right behind the stand. This is Farmer Frank. He (sorta) agreed to a photo after coming out of the fields to say hello. Frank’s reasoning behind this career changing move, is best described by himself. You can read it all about it in an article he wrote on the Bhumi website called The Growing of a Farmer. It’s truly a beautiful way to describe his journey from Manhattan to his move out here and a connection to the earth and growing food. It made me think about my recent journey from NYC to the Hamptons, and the past few months I have had out here full time while we get ready to head back to the city again. I suggest you read it because it made me tear up a little bit about my time out here and how much I have grown to love the sounds of the cicadas as I write in the evenings or the quietness of the night as I sleep, or the sound of the ocean as I read and build sandcastles. It does make you appreciate all that we have out here and how best to use that space and air and sound to then refuel and go back to the urbanness of NYC and all that entails. If you do read it, please let me know if you agree that Frank made the right choice and ended up exactly where he should be. It wasn’t always an easy road to fulfill this mission of providing “good food for good people.” In fact, there were some seasons where entire crops were lost! 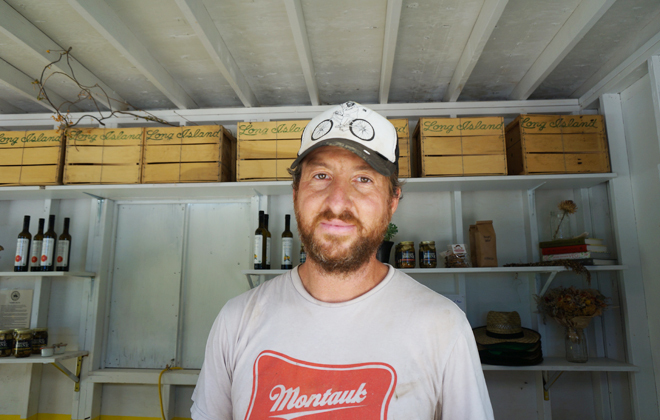 But with a thriving CSA, cooking classes, farm dinners, and now direct produce deliveries to Brooklyn and Manhattan, Farmer Frank is getting the hang of things. …and how about this handwritten signage? I am obsessing over the vintage Long Island bins that line the walls of the stand. Grab a seat! Even the chairs are on brand. Love it. And I hope to see many more seasons out at Bhumi! So if you’re out East this Fall, make sure to stop in a grab some truly farm-fresh produce from this fabulous local farm. It will be worth it. Now I am going to tuck into the gorgeous watermelon I picked up there. Organic and local watermelon of course!